This a listing for one weight and one nozzle, they come as a set. 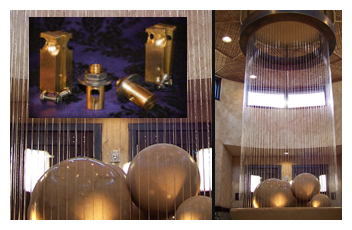 This jet is guaranteed to give you control of the water flow, that is imperative when making a rain curtain. The nozzle easily bolts on to your stainless steel weir, with a rubber washer for sealing it onto the weir box. Please contact us with the size of your weir. If needed, we can give you a quote for a stainless steel weir and stabilizer. Then, we will know the quantity of the jet and weights needed for your project. 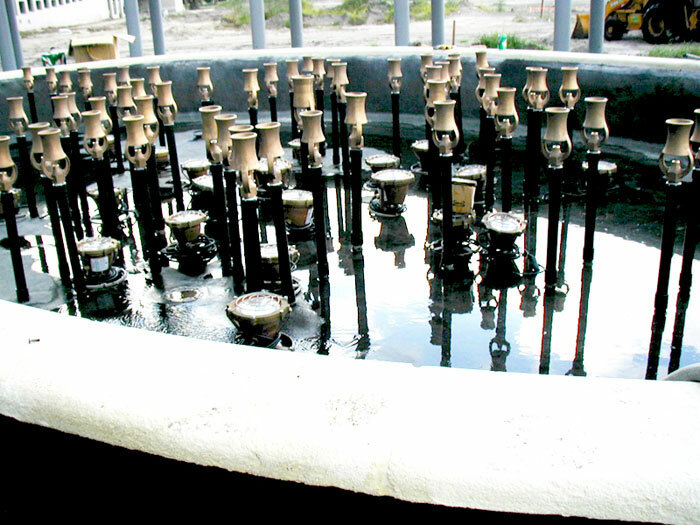 Note that the layout, and size of this type of fountain, is practically limitless. You can drop these up to 100' and angle the Mylar strips up to 20 degrees. This is the ultimate indoor splash less fountain. Can't find the right Water Fountain Replacement Part? Different water fountain suppliers carry products that can be strong in some areas and weak in others. Our history and knowledge will give you the best products available for your unique project and budget. Since we are a designer – builder, we will be streamlining your project, to give you the highest quality at the lowest price. Some projects will require hi-tech computerized controllers and some will be much more simplistic. 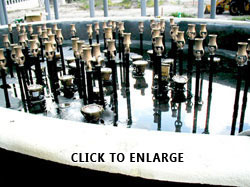 Contact Crystal Waterscapes, we can help you find the replacement part for your water feature.